Ring Wars Carolina: Event Results: "Luck and Envy"
Event Results: "Luck and Envy"
Stephanie Grey came out and welcomed everyone to the show and then announced our Guest Host of the evening James Anthony. James came out and welcomed everyone to the show and was ready to let Stephanie announce the first match when he was interrupted by the FireStar Pro Wrestling students. James Ryan, Tga Alexander Moss, Kent “The Alpha” Wolf & Kaydin Pierre - Pink Prince. They said that they were the better training school/promotion and where willing to prove it. They challenged 4 of RWC's best to a 8 Man Tag Team Elimination Match. After the match James welcomed the New RWC Heavyweight Champion, Nite-Stic Eddie Brown. James asked Eddie how did he feel about becoming the Champion once again, but Eddie didn't wanna talk about that he wanted to talk about the FSPW guys coming to invade RWC. James asked him would he be representing Team RWC tonight in the 8 Man Tag Team Match. He said yes and that he was making himself the Captain. RWC Jr Heavyweight Champion, Gem Stone came out and said that he wanted to be apart of Team RWC also but wanted to be the Captain. Gem stone told Eddie Brown that he wanted him to take the night off so that he could show and prove that he can lead the team to victory. This brought out Flex Simmons who said he was joining the team but, was gonna be the Captain because he has been in the company longer and without him Gem Stone would be a nobody! This started a shoving war between the too but, James told them both that if they wanna win they have to put there differences aside and work together, and go in the back and find 2 more partners to round out the team. 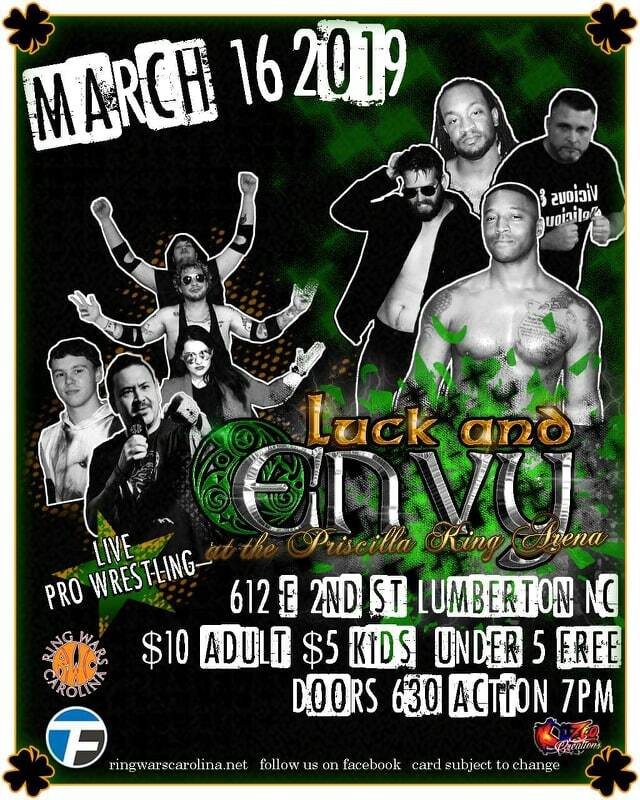 Before the match got Started Gem Stone would pick Jay Wolfe and James Anthony to be on the team but The Caribbean Tiger came out and said that he hates Gem Stone & Lumberton NC but he loves RWC and then asked James for his spot to prove that he can be a team player, James gave him his spot but said if he cost RWC or Gem Stone this match that he would have to deal with him 1 on 1. After the match The Caribbean Tiger returned to the ring and a brawl between him and Gem Stone took place. Security and officials tried to break up the fight but were unsuccessful. The locker cleared and the two where seperated, James Anthony then got a email from General Manager Earl Hebner stating that he watched the Main Event and was happy for Team RWC being successful. 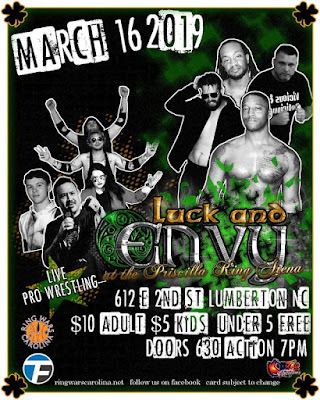 He saw what just took place with Gem & Tiger and decided to make this match for April 6th, Gem Stone defending the RWC Jr Heavyweight Championship against The Carribean Tiger and this will be a LumberJack Match! 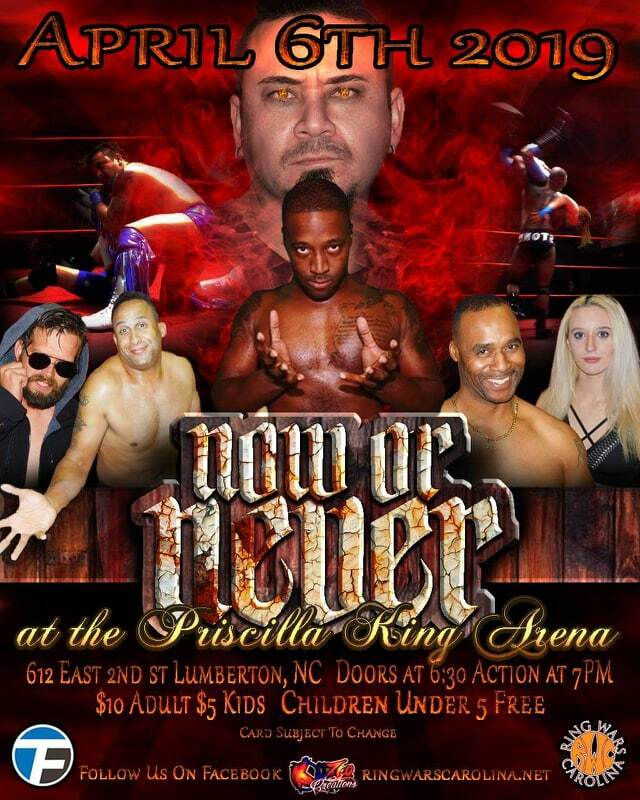 Our next scheduled event will be on April 6th entitled "Now or Never" at the Priscilla King Arena in Lumberton NC. 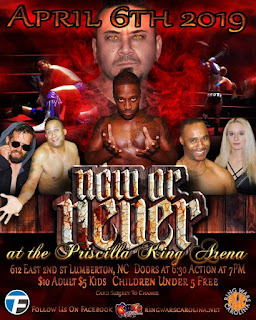 Next Event: " Now or Never"
Event Results: " March Madness"